1 Before specific items, pension deficit payments and the cash tax benefit of pension deficit payments 2 Excludes specific items, foreign exchange movements and disposals and is calculated as though EE had been part of the group from 1 April 2015. This differs from how we usually adjust for acquisitions 3 Before specific items 4 The results for the period include EE which we acquired on 29 January 2016.Unless referred to as underlying adjusted for the acquisition of EE, comparatives only include EE from the date of acquisition 5 Certain prior year results have been revised to reflect the outcome of the investigation into our Italian business. Our commentary focuses on the trading results on an adjusted basis, which is a non-GAAP measure, being before specific items. Unless otherwise stated, revenue, operating costs, earnings before interest, tax, depreciation and amortisation (EBITDA), operating profit, profit before tax, net finance expense, earnings per share (EPS) and normalised free cash flow are measured before specific items.This is consistent with the way that financial performance is measured by management and reported to the Board and the Operating Committee and assists in providing a meaningful analysis of the trading results of the group. The directors believe that presentation of the group’s results in this way is relevant to the understanding of the group’s financial performance as specific items are those that in management’s judgement need to be disclosed by virtue of their size, nature or incidence. In determining whether an event or transaction is specific, management considers quantitative as well as qualitative factors such as the frequency or predictability of occurrence. Specific items may not be comparable with similarly titled measures used by other companies. Reported revenue, reported operating costs, reported operating profit, reported profit before tax, reported net finance expense and reported EPS are the equivalent unadjusted or statutory measures. Reconciliations of reported to adjusted revenue, operating costs, operating profit, profit before tax and EPS are set out in the Group income statement. Reconciliations of underlying revenue excluding transit adjusted for the acquisition of EE, underlying operating costs excluding transit adjusted for the acquisition of EE, EBITDA, underlying EBITDA adjusted for the acquisition of EE, net debt and free cash flow to the nearest measures prepared in accordance with IFRS are provided in the notes to the condensed consolidated financial statements and in the Additional Information. Trends in underlying revenue excluding transit adjusted for the acquisition of EE, underlying operating costs excluding transit adjusted for the acquisition of EE, and underlying EBITDA adjusted for the acquisition of EE are non-GAAP measures which seek to reflect the underlying performance of the group that will contribute to long-term sustainable growth and as such exclude the impact of acquisitions and disposals, foreign exchange movements and any specific items. We exclude transit from the trends as transit traffic is low-margin and is affected by reductions in mobile termination rates. Given the significance of the EE acquisition to the group, in 2016/17 we have calculated underlying revenue excluding transit adjusted for the acquisition of EE, underlying operating costs excluding transit adjusted for the acquisition of EE and underlying EBITDA adjusted for the acquisition of EE (see note 3), as though EE had been part of the group from 1 April 2015.This is different from how we usually adjust for acquisitions, and was the basis for our 2016/17 outlook. Following the integration of EE since acquisition, from 1 April 2017 underlying trends will no longer be adjusted for the acquisition of EE since this is no longer relevant and the 2017/18 outlook has been prepared on this basis. We have prepared and published historical financial information adjusted for the acquisition of EE (previously described as pro forma historical financial information) for the eight quarters ended 31 March 2016 for the group and by line of business under our new organisational structure, to illustrate the results as though EE had been part of the group from 1 April 2014. This historical financial information adjusted for the acquisition of EE shows EE’s historical results adjusted to reflect BT’s accounting policies. 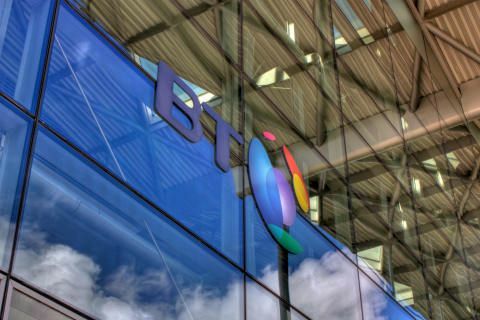 In the consolidated group total, we’ve eliminated historical transactions between BT and EE as though they had been intercompany transactions. We’ve not made any adjustments to reflect the allocation of the purchase price for EE. And all deal and acquisition-related costs have been treated as specific items and therefore don’t impact the published information.